This website, http://www.capozzoliancestry.com is a work in progress. 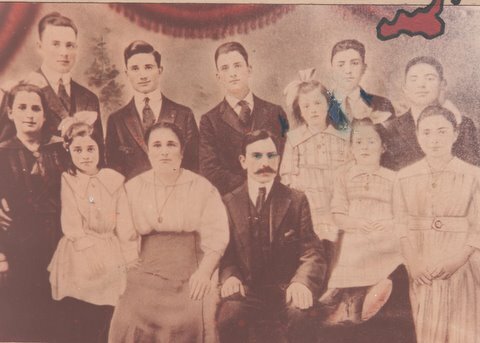 Hopefully, members of the Capozzoli family will share their stories, photos, and knowledge of family history so it may be preserved and shared for future Capozzoli generations. We have taken the liberty of sharing letters, and a lifetime of extensive research, by Thomas Capozzoli on this website. It was always his deepest wish this great story be told and not forgotten. In his stories, Thomas shares how his grandparents, Luigi Capozzoli and Maddalena Peduto met in Italy and came to be married. He describes their lifestyles and backgrounds, the countryside where it all began, and the love that grew between his grandparents. This love ultimately led to their courageous journey to America and the parenting of ten children. This is a great story of love, sacrifice, hard work, family values, and depiction of our family tree. The Capozzoli family is very proud of its roots and heritage. This website is designed so information can be added as we work along together. Along the right hand column are pages reflecting the lives of family members. Click on each topic and take a wonderful journey with the Capozzoli family. Please email either of us if you have ideas, information to share, photos, or questions at linda@capozzoliancestry.com or barbara@capozzoliancestry.com. Any new information will be incorporated into the website. If you notice errors, please let us know so they may be rectified. The pages of this website can be copied and pasted to your word processing program. The pages can be printed in book form without the website data surrounding the pages. We need family information for the branches of 10 children born to Luigi and Elena! Hi! I am Emily aopnzzoli’s Great Grand Daughter. I came across this page while researching information for a school project. I want to thank you for preparing this page, it is truly amazing! I have learned so much from the 30 minutes I was able to spend on here. So again, thank you so much!